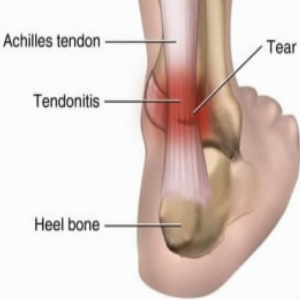 Achilles tendinitis is an inflammatory condition that involves the ‘Achilles tendon,’ the tendon that anchors the calf muscles on the back of your leg to your heel bone. This tendon is involved in walking, running, and jumping. Tendinitis is the condition in which the tendon becomes swollen, tender, painful, and/or inflamed as a result of microtraumatic tears. If this continues on a chronic basis, the inflamed tendon may develop degenerative changes (tendinosis) that could ultimately create conditions for an acute tendon rupture…. and the dreaded reconstructive surgery that would follow. Achilles tendon problems frequently occur in athletes and are not uncommon in the general population. The frequency of Achilles tendinopathy in athletes has been reported in several studies. Elite long-distance runners have a lifetime risk of 52%, according to one study. Other studies have reported annual incidence rates of Achilles tendon disorders between 7 to 9% in top level runners. Among the military population, an incidence rate of 2.98 per 1000 person years was found. But Achilles tendon problems are not always associated with excessive physical activity. They are also seen in patients who do not participate in sports. When symptoms are confined to heel pain, the cause is most often due to overuse of the foot. Rarely is the symptom of just heel pain caused by an instant injury, per se. There has been a sudden increase in the amount or intensity of an activity, such as hill running. The calf muscles are very tight and inflexible. You jump frequently, such as when playing basketball. When there has been a change in shoe wear or when wearing shoes with improper support. When your foot tends to collapse inward or outward during normal standing (pronation or supination of the feet. We have an answer for many that suffer with Achilles tendinitis, particularly chronic or recurrent cases. Our office offers a distinctly successful protocol for many Achilles Tendinitis sufferers that addresses most of the significant muscular/mechanical factors that are involved in this condition. In many cases, particularly those uncomplicated by advanced tendinosis or other co-existing medical issues, we often observe positive results in as soon as 3-5 treatment sessions. We invite those who are suffering with this injury to arrange a consultation with us to determine if our protocols might be right for you.